This will probably be my last private with Dónal for a while, as I've covered the majority of what I wanted to work on for the next year or two. Today I was keen to add some more side control chokes to my game, along with refining the few I know. Dónal began with the breadcutter choke (I think that's what it's normally called), setting it up by moving towards north-south. They will often reach past your hip when you do that, which leaves a space for you reach under their arm and clamp it to your side. Move back to side control, then with the hand of that clamping arm, grab behind their neck, gripping in the middle of the collar. Cinch that in. Bring your free arm back towards you, then use that to turn their head away from you. This is in order to expose the side of their neck. Grip their far collar with your free hand (this might require balancing on their chest, turned towards their head, which should also help keep them pinned to the mat), then put your forearm into the exposed side of their neck. 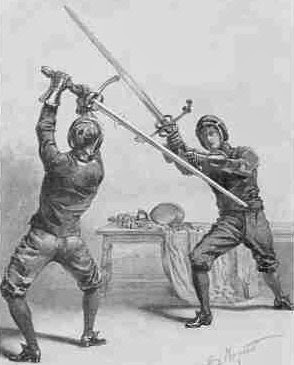 A similar option is the baseball bat choke, so called because your hands are in the same position as if they were gripping a bat (or a greatsword, if you want to picture something cooler. 'Greatsword choke' has a nice ring to it, or maybe 'dai-katana choke', for fellow Daggerfall fans. ;p). It's often done from knee on belly, as in the screencap from Roy Dean's Brown Belt Requirements, but I rarely use knee on belly. I much prefer side control, so Dónal showed me the application from there instead. Again you want to grip the collar behind their neck, but this time you aren't going underneath their arm. Your other hand reaches over to the other side of their neck, gripping the collar just above your first hand: this is where that 'Greatsword grip' (that has a nice ring to it too! :D) comes in. A key detail Dónal adds here is that you then 'engage' your arms. By that, he means tense the muscles slightly, squeezing into their neck. This shouldn't be straining, but enough to create pressure. From there, spin around to north-south, putting your head by their far hip. Your bum raises slightly for added pressure. Often, they will tap before you get all the way around, because you already started applying to submission as soon as you engaged your arms. It is possible to do this choke by squeezing at the end, but I prefer Dónal's method. You can also use the gi tail to apply the baseball bat choke: the grip is the same as for the attacks from guard Dónal showed me last week. Yet another option is to do the technique in reverse, so you establish your second grip before the first, in order to overcome their defence. To work out the position you need, set up the baseball bat choke as normal, then before spinning around to finish, look at where you second hand is. Reset, but this time, put that second hand in place first. Switch to the other side, bringing the elbow of your second-grip arm across. Put in your first grip, engaging your arms, whereupon you finish as in the standard version. The gi tail also comes in handy for a variation from Norbi. They are defending, so their arm is bent, protecting their neck. Wrap their gi lapel on the same side straight over their arm, feeding it to your hand under their head to lock it in place. You can potentially apply an americana from here by lifting their elbow: another tip on that submission is to control their wrist by bringing your chin to your chest, then bring your head to the mat to get their arm into an americana position. If you're not doing the americana, then you just wrap the arm up as above, but use that as an opportunity to establish your grips for the baseball bat choke. We finished off with the step-over triangle, which is the one technique from today I already use frequently. I first learned it in a nogi class with Felipe Souza back in 2007, along with a few times since, like when Kev taught it in 2010. However, I rarely use the step-over triangle as a submission: normally I just use it for control, then attack the far arm. I have finished the choke occasionally, but most often that happens without a focused effort to get the submission: I just happen to be tighter on the neck than I thought while going for the arm, or the person I'm sparring is less experienced and taps before there is truly the threat of a choke. Dónal's method had some similarities to the way Roy Dean teaches it on his latest release, Black Belt Requirements (review forthcoming). Like Roy, Dónal also sets it up from scarf hold, stepping over the head, then bringing that leg back to press firmly into their neck. Locking up the triangle, your other leg curls back, then you finish by reaching behind you and pulling their arm and squeezing. The way I've done it in the past was flatter, more like in the picture on the right of Yuki Ishikawa on yellow mats (being careful to lock on the ankle not the foot): it will be good to add Dónal/Roy Dean's method as another variation.